Not too long ago, websites were built using tools like Adobe Dreamweaver or by writing the HTML code from scratch. Once the site was built, there was no easy way for the content creators to update the website’s content. Updating content frequently required rewriting the HTML, which could be time consuming and required a specific set of skills. This meant that, for many sites, the content remained static. Most corporate and personal websites built today are dynamic, with content that can be updated instantly so that news, information, and products are always current. 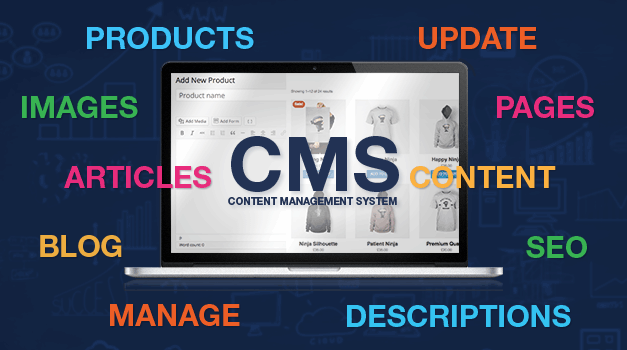 Content management systems (CMS) have become an increasingly popular way to manage dynamic websites, powering small and large websites alike. After the initial CMS setup by a developer, anyone with minimal training can use a CMS interface to update content and publish articles and products—getting content to customers and subscribers faster. Another advantage of using a CMS is the flexibility of the design. While data is moved through a prebuilt system, the design and layout can be completely customized so the website user has a personalized experience. These custom designs can be created from scratch or built from preexisting themes. The appeal of themes is that they have common website structures built in—like header, content, and sidebar areas. The downside is that they tend to have a “template look” and force you to squeeze your needs into a predefined format. A good compromise is to use a theme as a starting point and then have a developer customize it to fit your specific website needs. When selecting a content management system, open source systems are a great option because they are free and already have the base components for a setting up a dynamic website. The most popular open source content management systems also have the advantage of large communities of developers creating custom modules and plugins for the CMS, which allows specific functionality options like SEO, ecommerce, and contact forms to be integrated into the CMS without needing to build the functionality from the ground up. Many of these modules are also open source and available for free. A little planning on what functionality you need goes a long way in choosing the right modules for your site and how to integrate them. ZDNet cites a recent report from Forrester Research estimates that at least 66 percent of all content management systems in use today are open source CMS1. The three most popular open-source content management systems right now are Wordpress, Joomla, and Drupal, respectively, with a combined CMS market share of more than 73 percent2. These are well established CMS and most likely won’t be going anywhere soon. There are many more CMS out there and many are geared toward specific interests and industries. If you don’t have a system in place to manage your website’s content dynamically, you’re probably losing time, money, and sacrificing flexibility. Street Level Studio can help you choose the right content management system and customize it to fit your needs.